….. And I feel like a new woman! But first, let me back up and give some history. For the past few months of my pregnancy, I’ve been experiencing pelvic muscle pain. Which means every time I walk or use my legs, it hurts. But it’s not a sharp, searing pain. Just a dull, achy pain. This same thing happened during the last trimester of my pregnancy with the Bubbers King, so I recognized the symptoms. But then over the last couple of weeks, the pain intensified. And before I knew it, every muscle and joint from my belly button to my knees hurt. And it never went away. I went to bed hurting and I woke up hurting. But now it was more than a dull ache. It was getting sharper and sharper. And then I started limping. Like an 85-year-old woman with arthritis. This has got to stop, I finally told myself. There’s no way I can keep going like this for three more months. And then I called my husband. “Hey, what’s up?” he asked. “You mean a belly bra?! ?” he exclaimed and then burst out laughing. “So, is it okay with you if I get one?” I smiled. Then we said goodbye and hung up. I immediately put in a call to my doctor, but he was out for the rest of the afternoon delivering a baby. “I’ll have him call you tomorrow,” the secretary said and we hung up. I limped around all the next day, eagerly awaiting his return phone call. Finally, at 9:15 pm that night, my phone rang. So he called it in. And I picked it up today. I put it on as soon as I got home. And it’s not likely I’ll ever take it off again. Congratulations! 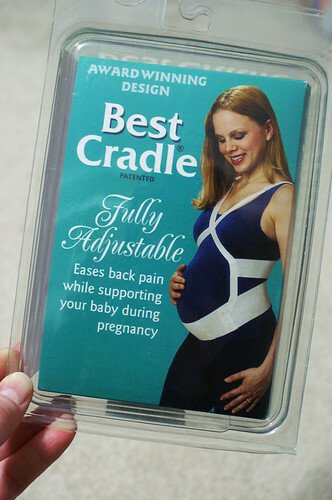 I had no idea you were in such pain – I’m glad the belly bra is helping. I love Dr. B!! Yeah, glad it is helping you feel more comfortable! okay, where was this when I was lugging around a 10 lb. baby? Glad you found something that helps. I’m so happy it is helping and you are feeling better! I felt bad with you moving around so gingerly at playgroup! You poor thing! :( I didn’t know you were having so much pain either! But I’m SO glad you found something that helps! I’m glad they were able to bill your insurance too – if I remember correctly, those things aren’t cheap! I had painful circulation problems w/ my last two pregnancies, so my Dr. gave me an Rx for maternity compression stockings – made a world of difference! I had that problem when pregnant with Elora, I was always sore and out of joint or something. I wish I’d have known that that was a solution then! I haven’t had to deal with it with these last two pregnancies though, thank goodness. Glad you found something that helps! I bought a different maternity belt when I was pregnant with Isaac. My problem was ligament pain. I’m glad it seems to be working for you! That one looks much nicer than the one I got. I didn’t know insurance could pay for it, or I might have gotten one a little nicer! Hey!! That is great…never heard it called a belly bra though, that is way cute!!! You guys always seem to crack me up!!! :) Hope you are feeling better!